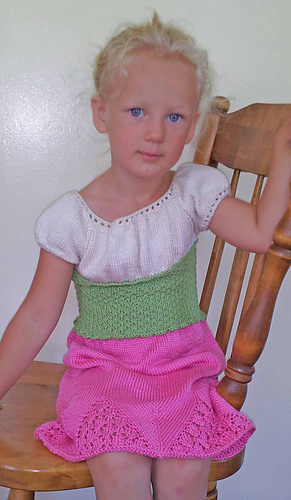 This sweet dress is perfect for a quicker project, the smallest size is perfect for a baby gift and can be completed easily in a weekend. 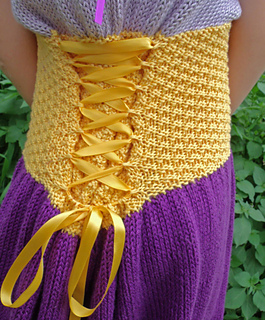 Knit in the round from the top down and using a unique sleeve seem that is worked as you go you will not have to go back and seem the sleeves weave in an end or synch up a hole. 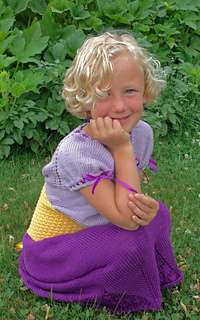 Cascade Ultra Pima yarn makes a fantastic washable option for children and the colors available are truly amazing! Every child is different, and every child grows, the length can be adjusted in several places if your child is longer or wider than average. Two ages are given for each size. This is designed to be a little big for the smaller age and fit until the child reaches the larger age of each given size. 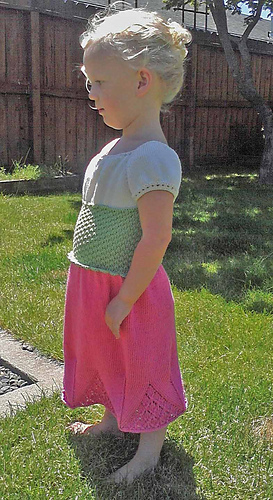 Pictured in pink and green is a size 2 to 4 years on my daughter at ages 2 and 4. Pictured in violet and gold is a size 5 to 6 on my very slim and tall daughter now at age 5. I used a slightly larger gauge of 5 sts per inch to make sure it will fit for many years, and to illustrate the options available by adjusting gauge. 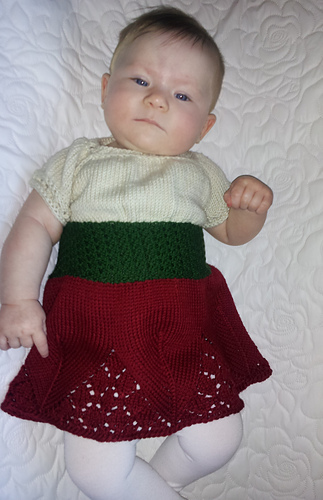 Pictured in red and green is my darling niece at 8 months in the size 6 to12 months, She was not impressed with Auntie’s knitting. 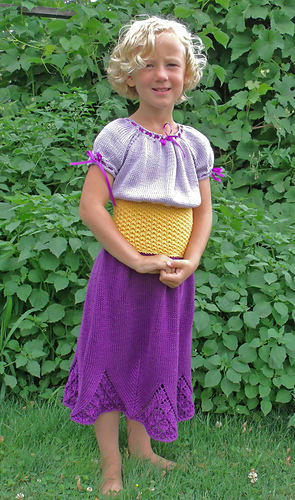 Most toddlers grow up more than out, so if you make the dress long enough they can wear it for a couple of years. The 6 to 12 month size is much shorter to allow for little knees that are just starting to crawl, no little one wants to deal with that frustration!